Accompanied by GIA report no. 2115516430 stating that the diamond is D color, VVS1 clarity, with Excellent Polish and Excellent Symmetry. Accompanied by GIA report no. 1122998496 stating that the diamond is D color, VS2 clarity. 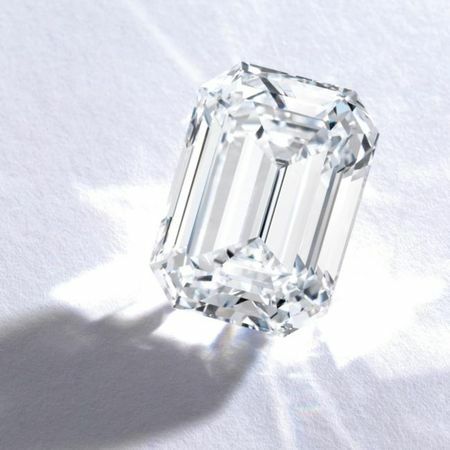 Together with a letter from the GIA stating that the diamond has been determined to be type IIa. Accompanied by GIA report no. 17424000 stating that the diamond is D color, Internally Flawless. Together with a letter from the GIA stating that the diamond has been determined to be type IIa. Also accompanied by Gübelin report no. 1011150 stating that the diamond is D color, Internally Flawless, and a note from Gübelin stating that diamond is classified as a type IIa. Together with an appendix from Gübelin stating that the diamond possesses an antique cutting style which is rarely encountered in the gem trade today, and diamonds of this type, exhibiting an antique cutting style as well as a superior quality, are very rare and will most certainly evoke references to the historic term of 'Golconda'. 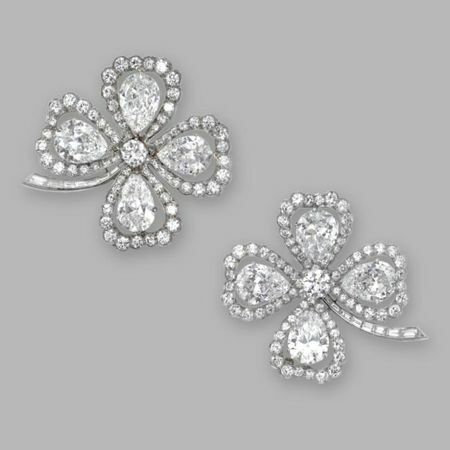 For centuries, India was the sole source of diamonds to the world. 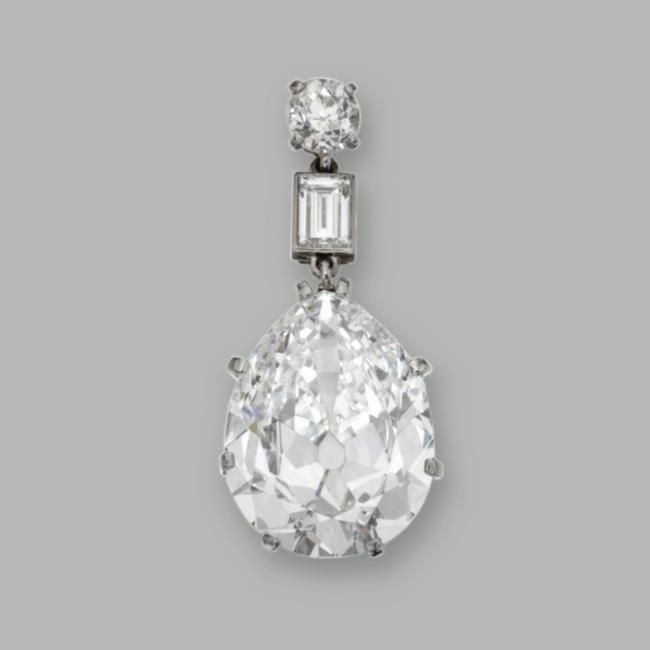 And of the many diamond mines in India, the Golconda mines were the most famous, producing some of the world's best-known diamonds including The Koh-i-Noor and The Hope. A Golconda diamond is distinguished by a high degree of transparency as a result of the purity of its crystal, resulting in a limpid quality that is reminiscent of a drop of ice water. It also represents a specific type of pure carbon known as type IIa, containing no significant amount of nitrogen in its crystal lattice. 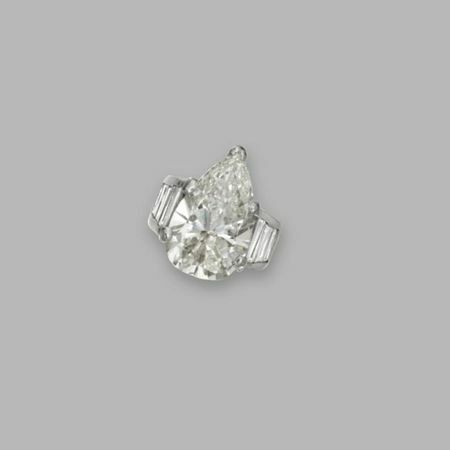 The absence of nitrogen, the element which imparts a yellowish hue to diamonds, results in a diamond that is colorless and often said to be beyond white. 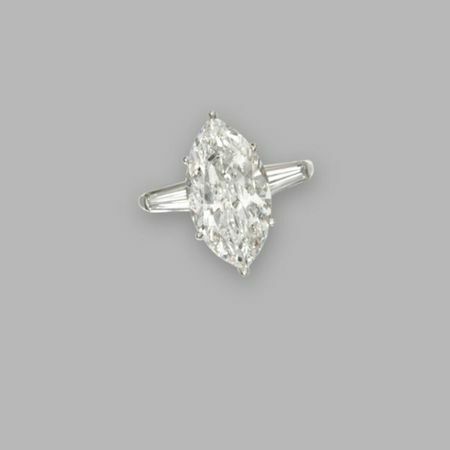 With less than 1% of the world's diamonds classified as type IIa, this pure diamond is as rare as it is beautiful. Accompanied by GIA report no. 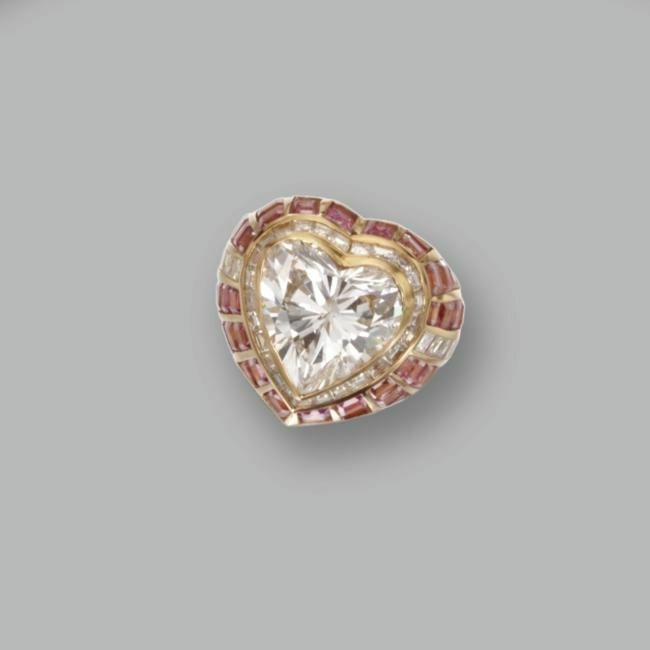 2125998515 stating that the diamond is I color, VS2 clarity. No. 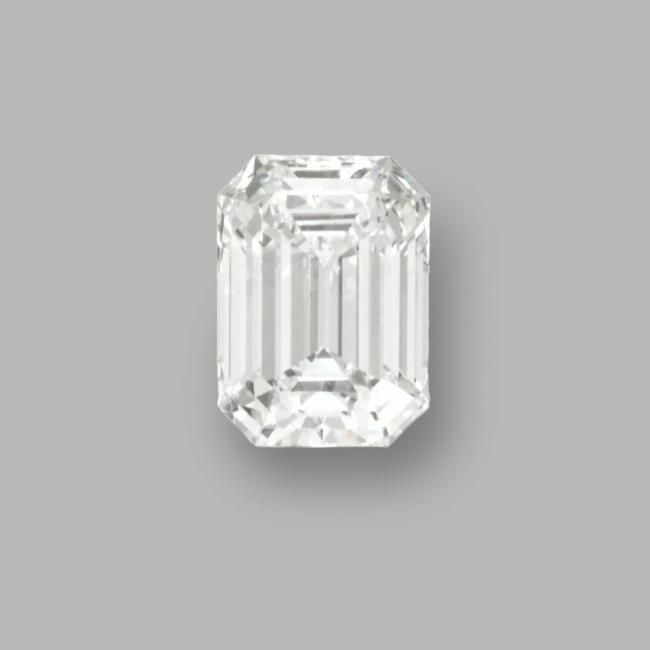 2125998518 stating that the 3.54 carat diamond is E color, VVS2 clarity. No. 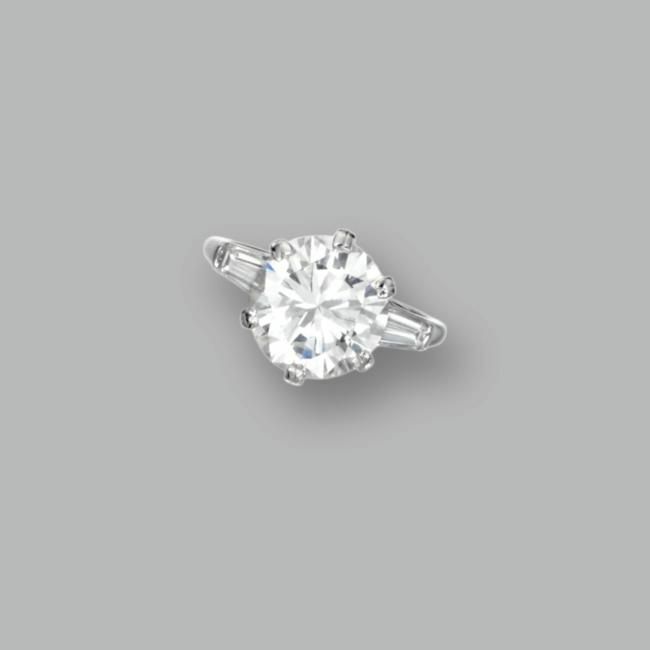 2125998533 stating that the 3.21 carat diamond is G color, VS1 clarity. 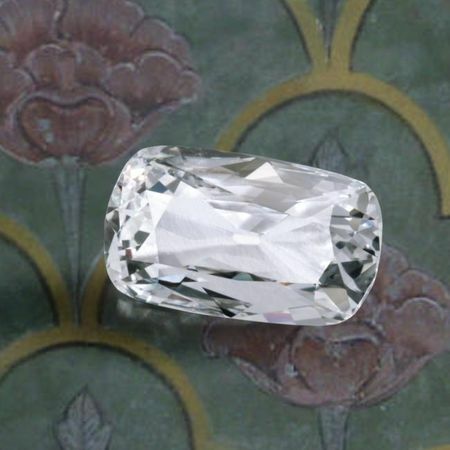 Together with a letter from the GIA stating that the diamond has been determined to be type IIa. No. 5121998497 stating that the 2.97 carat diamond is E color, VS1 clarity. Together with a letter from the GIA stating that the diamond has been determined to be type IIa. No. 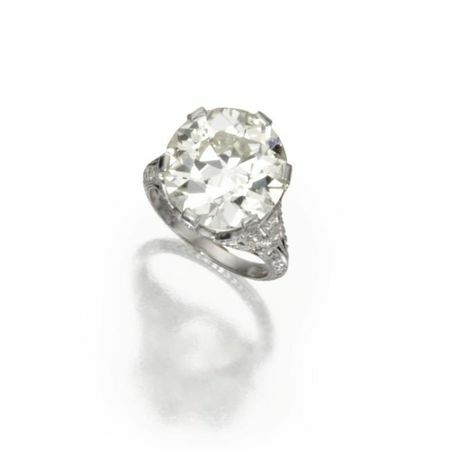 2125998523 stating that the 2.91 carat diamond is E color, VVS2 clarity. Together with a letter from the GIA stating that the diamond has been determined to be type IIa. No. 5131010586 stating that the 2.91 carat diamond is E color, VS1 clarity. Together with a letter from the GIA stating that the diamond has been determined to be type IIa. No. 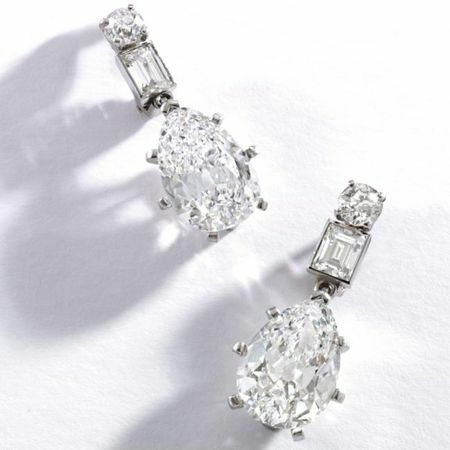 2125998479 stating that the 2.87 carat diamond is D color, VVS2 clarity. No. 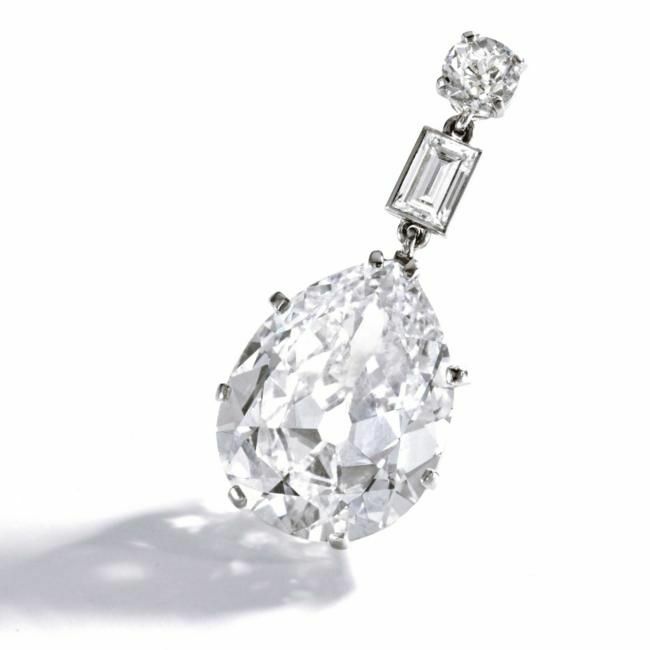 2125998500 stating that the 2.75 carat diamond is E color, VS1 clarity. Together with a letter from the GIA stating that the diamond has been determined to be type IIa. No. 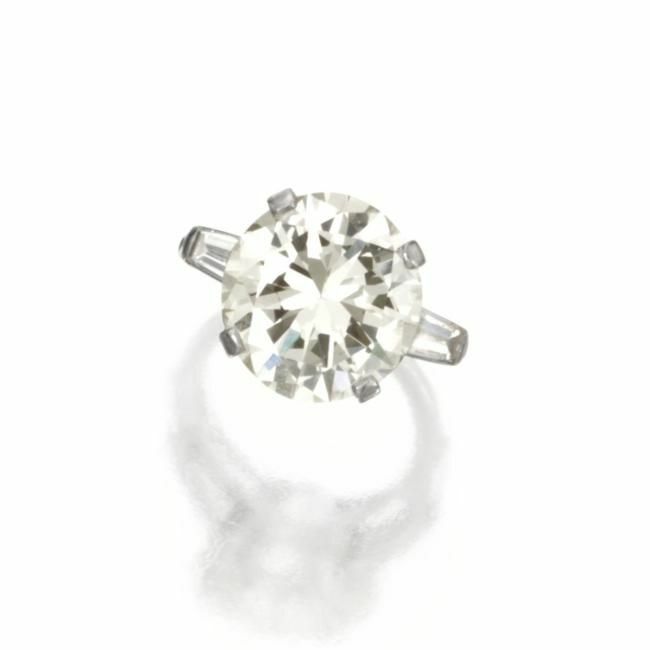 5121998530 stating that the 2.48 carat diamond is F color, VS1 clarity. Accompanied by GIA report no. 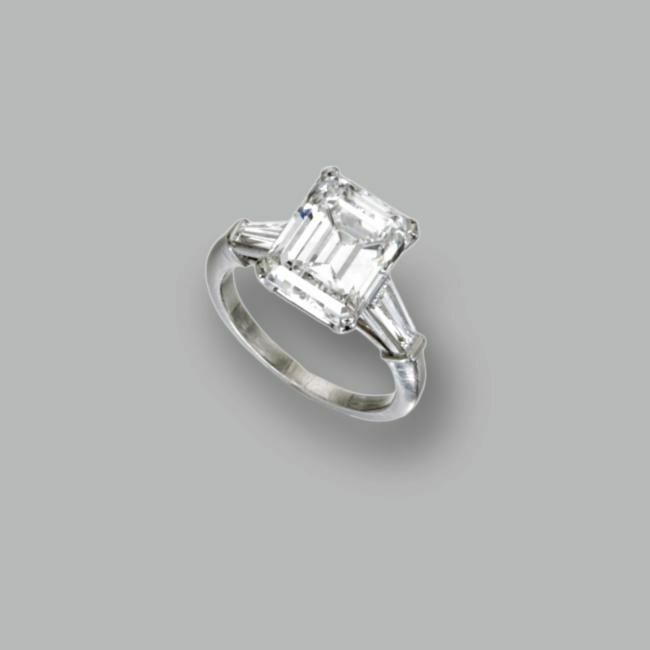 2135002551 stating that the 7.81 carat diamond is I color, VS1 clarity; and GIA report no. 1132006563 stating that the 6.90 carat diamond is G color, SI1 clarity. Mrs. Jack Warner. Born in Louisiana, Ann Boyer arrived in Hollywood in the late 1920s, where she met and married Jack L. Warner, co-founder and head of Warner Brothers Studios. In his memoirs Jack Warner wrote of his wife Ann, "If there is such a miracle as love at first sight anywhere but in a picture script, then this is what happened to me." Ann Warner became a legendary Hollywood hostess, entertaining statesmen and European royalty throughout the 1940s and 50s at her beautifully appointed estate in Beverly Hills. Dressed by Balmain and adorned with jewels from the best houses, Mrs. Warner had a style that dominated Hollywood for years. After her death in 1990, many of the magnificent jewels of Ann Boyer Warner were sold by Sotheby's in New York. Flato. This brooch was possibly designed by Fulco di Verdura for Paul Flato. 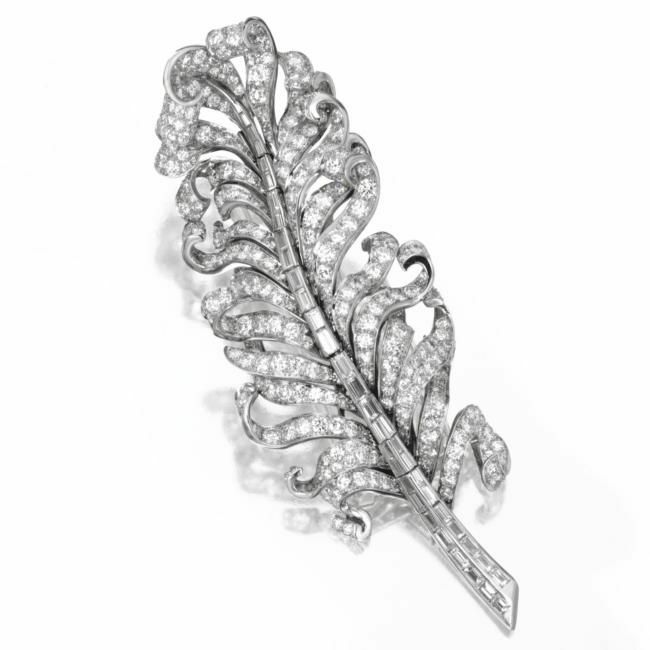 Having served as Chanel's textile and then jewelry designer, Verdura came to the United States in 1934 and joined Texas-born Flato's firm in 1936, creating as "Verdura for Flato" three-dimensional jewels inspired by nature such as this feather with curling tendrils articulated at each juncture with the quill. 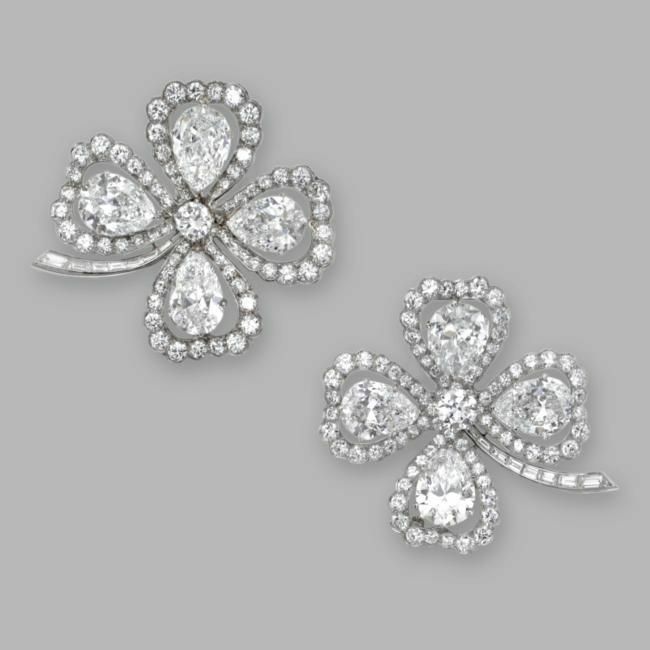 Ultimately opening a store on Sunset Boulevard in Los Angeles in 1938, Flato and his new designer, Verdura, targeted Hollywood. 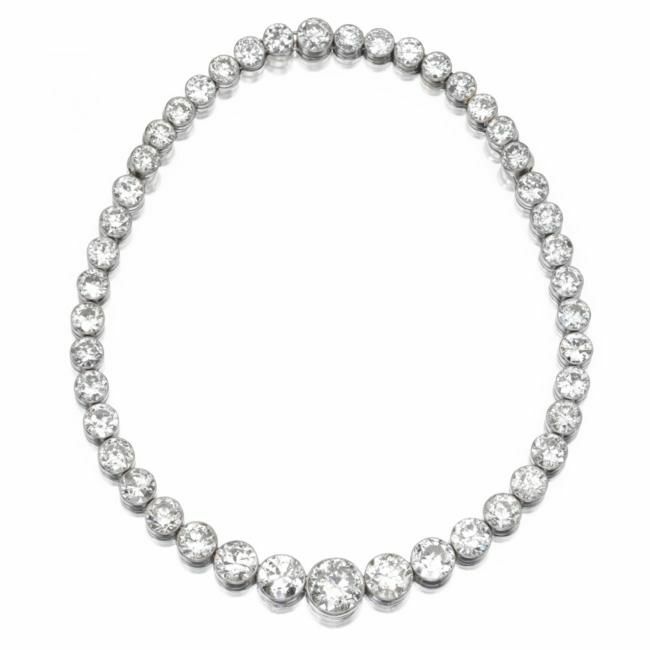 Many of its biggest stars - Katharine Hepburn, Joan Crawford, Merle Oberon, Paulette Goddard, Marlene Dietrich, Loretta Young - wore Flato jewels, including those designed by Verdura. Ann Warner was Hollywood royalty with a fabulous jewelry collection. She also was a friend of Verdura so it stands to reason that she would have a jewel designed by him. 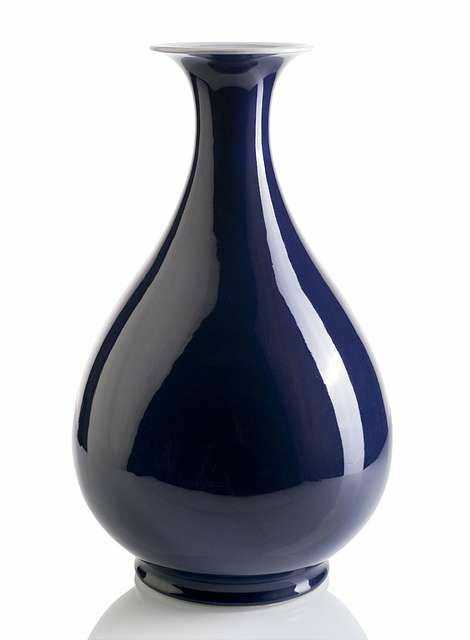 Admirers of his designs for Flato also included Cole and Linda Porter whose financial backing allowed Verdura to open a New York showroom under his own name in 1939. Accompanied by GIA report no. 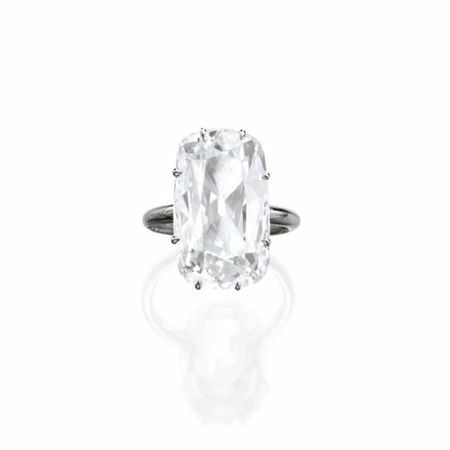 17165961 stating that the 6.44 carat diamond is J color, VS2 clarity; and GIA report no. 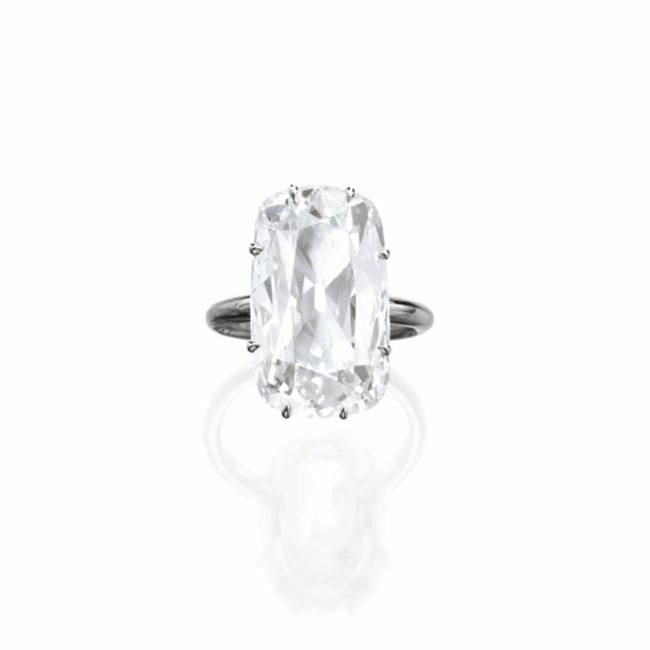 17165959 stating that the 6.06 carat diamond is J color, VS1 clarity. Accompanied by GIA report no. 1122674037 stating that the diamond is D color, VVS1 clarity. 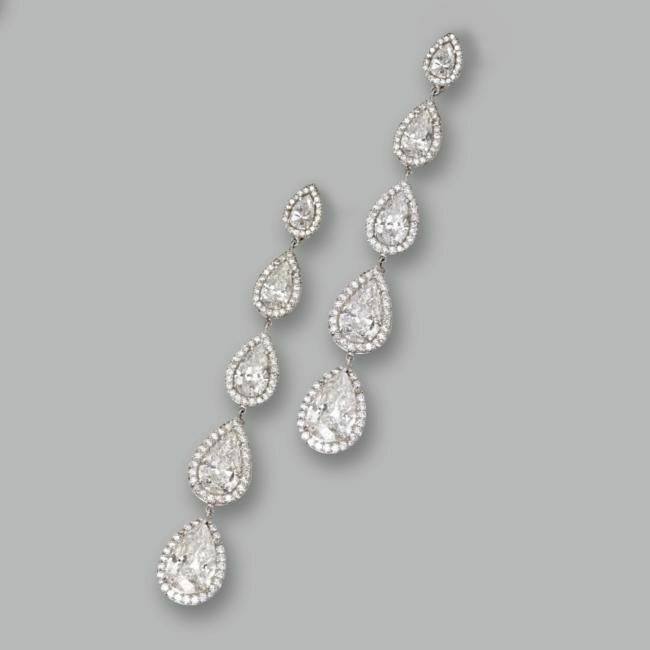 Accompanied by 8 GIA reports stating that the diamonds are D to F color, VS2 to SI2 clarity. Accompanied by GIA report no. 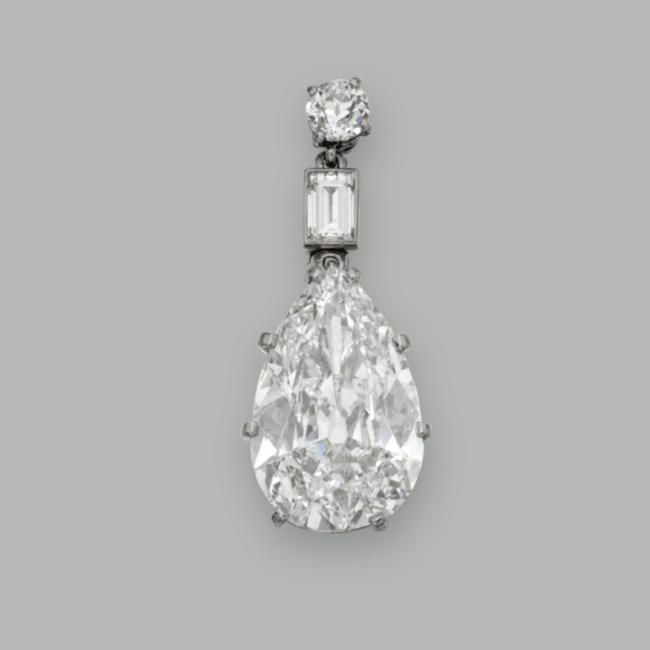 17621783 stating that the 5.12 carat diamond is J color, VS1 clarity, Excellent Polish and Symmetry; and GIA report no. 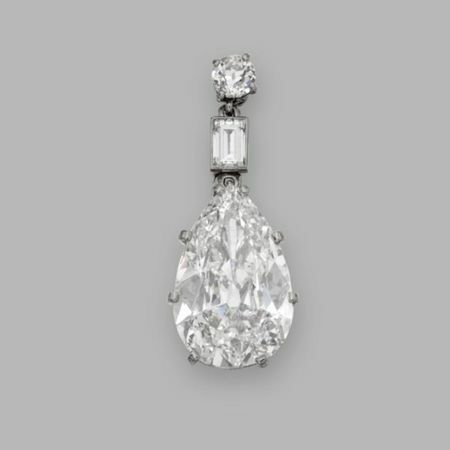 17621773 stating that the 5.06 carat diamond is J color, VS1 clarity. Accompanied by GIA report no. 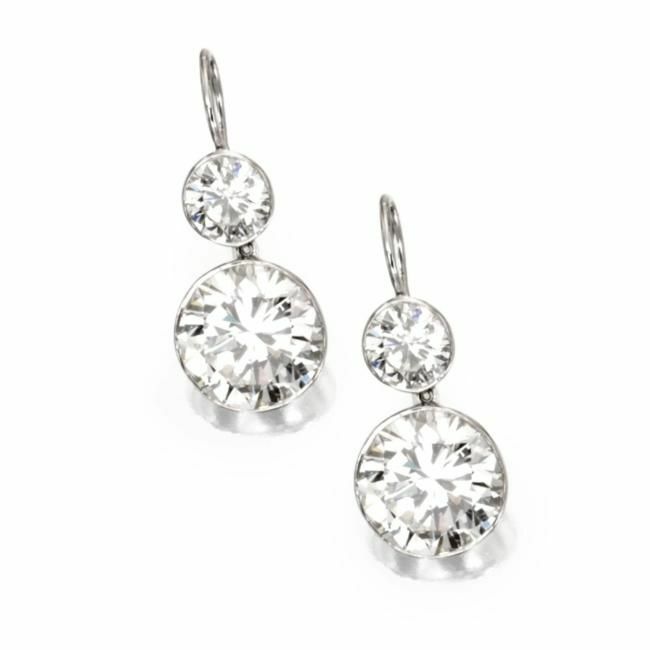 1102804468 stating that the diamond is G color, VS1 clarity. Accompanied by GIA report no. 5340901 (dated June 12, 1991) stating that the diamond is F color, SI1 clarity. LITERATURE AND REFERENCES: An illustration of the bracelet/brooch combination is found in Raymond Templier: Le bijou moderne, by Laurence Mouillefarine and Véronique Ristelhueber, p. 163, pl. 2. Also found in Art Deco Jewelry: Modernist Masterworks and their Makers, Laurence Mouillefarine and Évelyn Possémé, p. 215. NOTE: Modernist jeweler, Raymond Templier, is known for his geometric compositions, which drew inspiration from modern technology. Templier said, 'When I walk through the streets, I see ideas for jewelry everywhere - wheels, cars, the machines of today, I am ready to respond to all of them.' 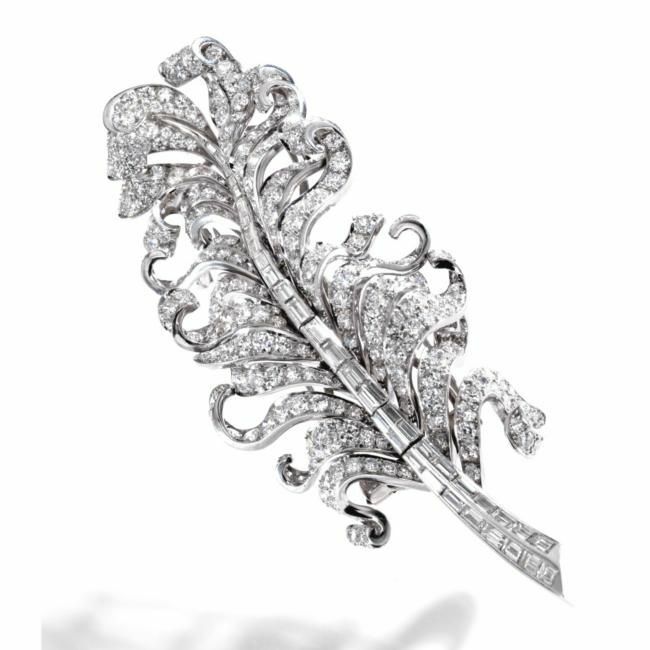 Born into a dynasty of Parisian jewelers - Maison Templier et Fils, founded by his grandfather in 1849 - Templier joined the family business in 1922 and began creating his unusual jewels. He regularly participated in international exhibitions and was involved in the contemporary art movement in Paris, where he was a founding member of the UAM, Union des Artistes Modernes. In 1935, he took over the management of the firm which remained open until 1965. 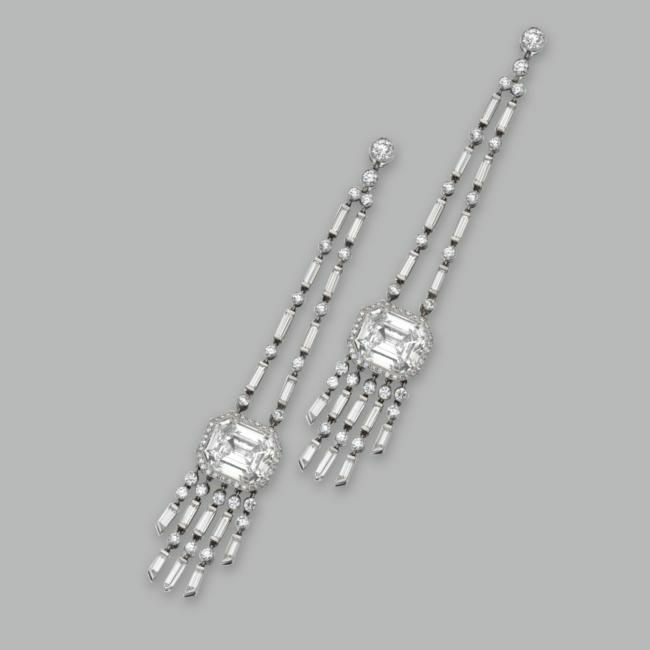 As an innovator of jewelry during the Art Deco period when geometric forms dominated the fine and decorative arts, Raymond Templier created designs that have become emblematic of their time. 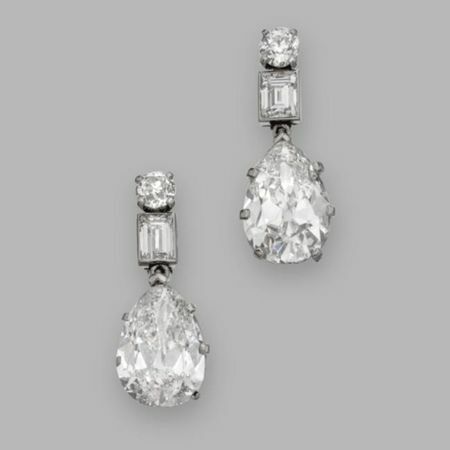 His mode, characterized by contrasts of matte and shiny surfaces and volumes and flat planes, was reflective of art rather than of traditional jewelry that emphasized important gemstones. 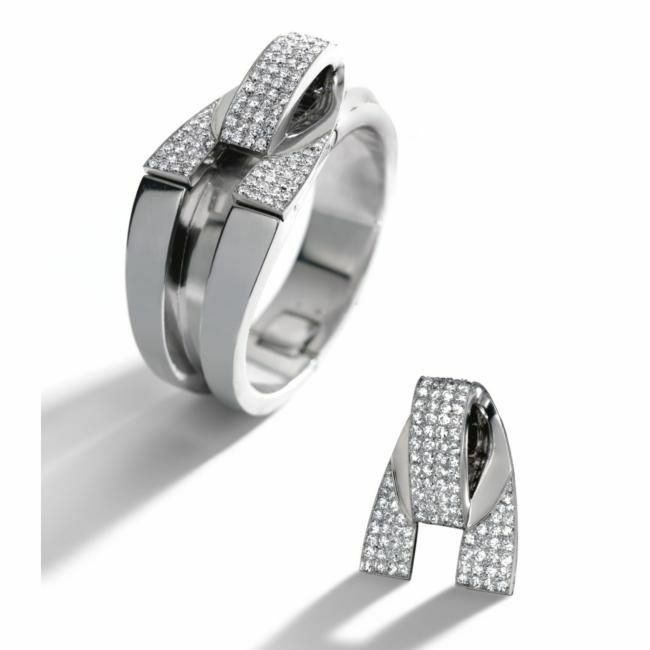 Templier said, 'A piece of jewelry is above all dark and light and not just sparkle.' Although he utilized precious gemstones such as diamonds, it was in an imaginative manner that is evocative of an artist who paints with particular hues or a sculptor who fashions forms out of a variety of materials. 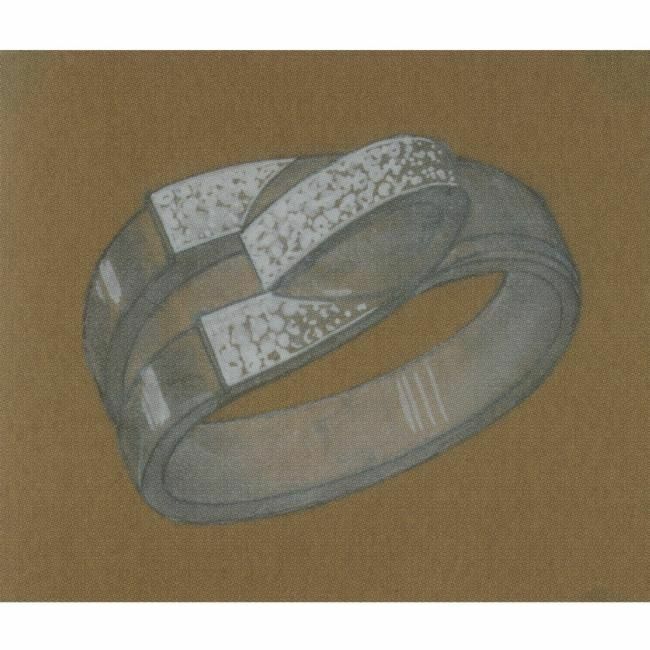 Templier created jewelry that was about design, not about the materials. The design of this bracelet is simple, yet its subtle complexity denotes the work of a master. 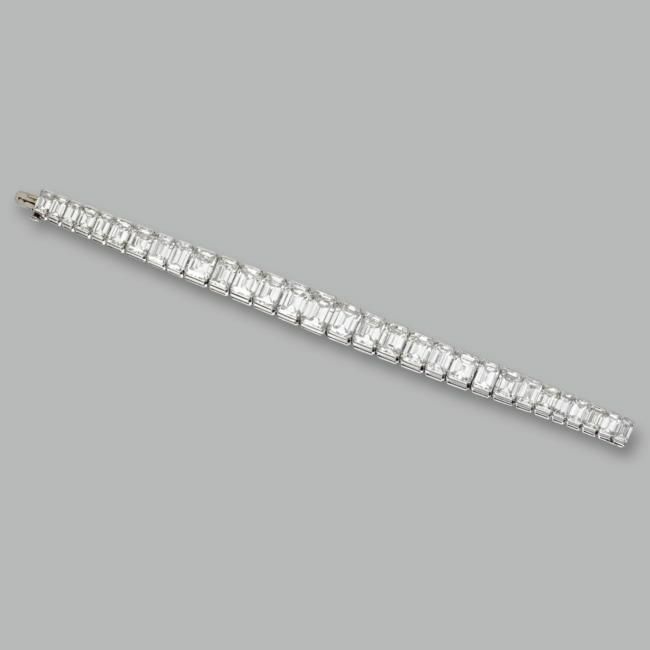 Whereas bracelet bands are usually the same pattern from one end to the other, this bangle is created as a solid mass on one side of the clip brooch while the opposite side is divided in the center by a furrow. 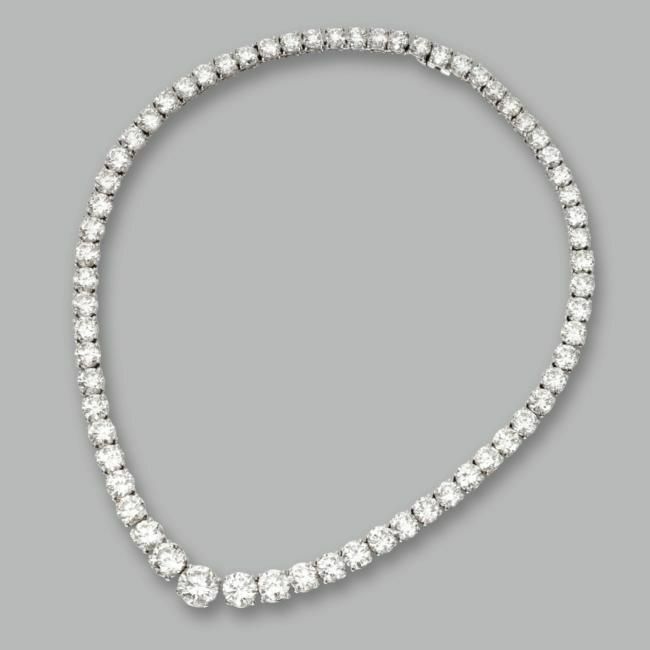 The diamond-set clip brooch can be removed from the bracelet and worn separately. 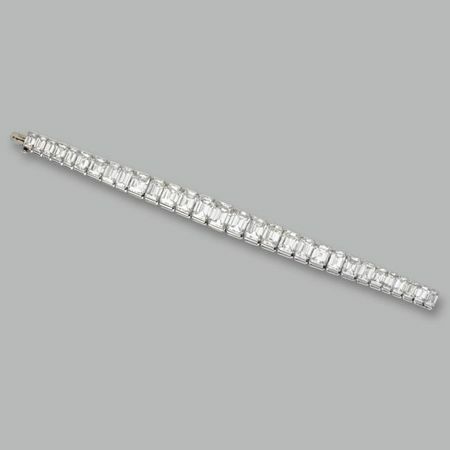 This convertible bangle-bracelet with a clip brooch is among the first such conceived jewels that can function in a dual manner. Only a few very gifted designers break with the past to create a new style. 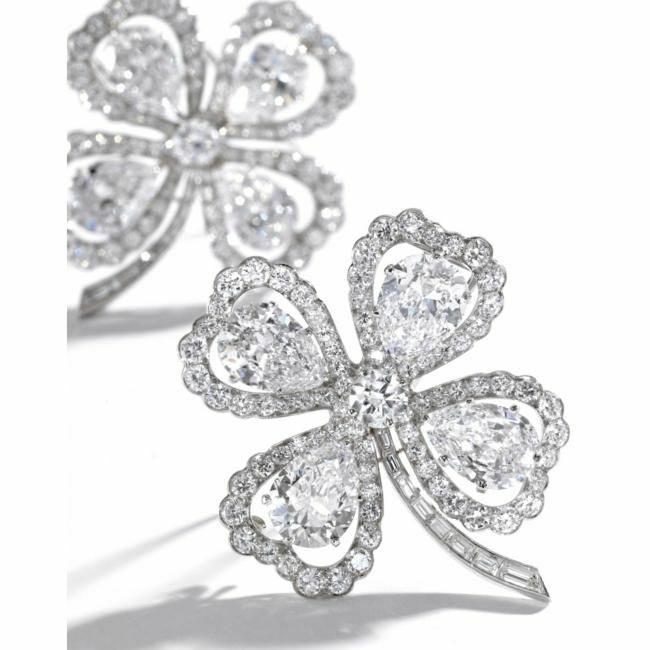 Raymond Templier is one such innovator whose jewelry transcends time. 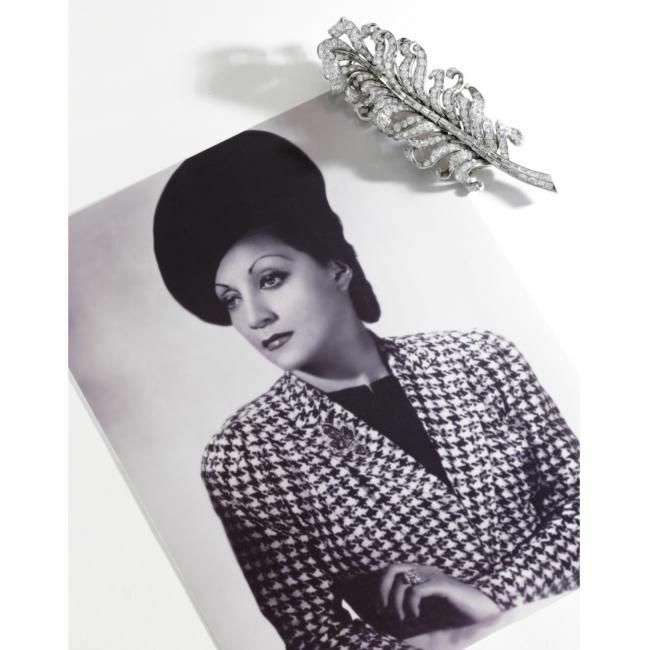 This bangle-bracelet and clip brooch is emblematic of the mid 1930s but its style resonates with jewelry connoisseurs today. 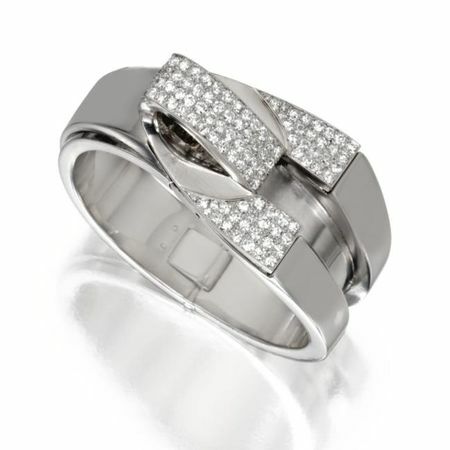 Platinum and Diamond Ring. 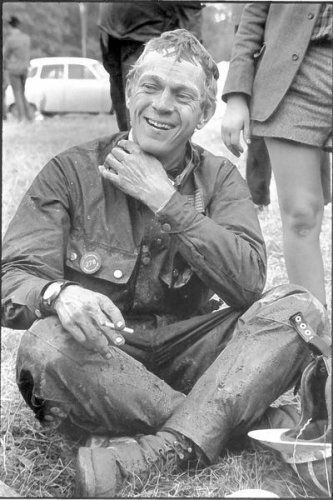 Photo Sotheby's. Accompanied by GIA report no. 2135054365 stating that the diamond is H color, VS2 clarity. 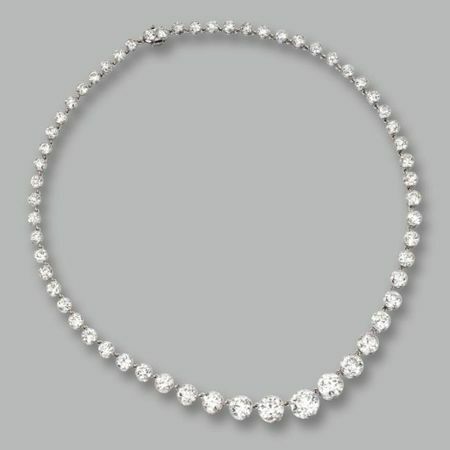 A magnificent pear-shaped golconda diamond necklace.